As a fan of Cassadee Pope, it's not surprising that I would end up reviewing this music video. It is a soulful country song, and even though I am aware of Chris Young, his voice still astounds me, it's authentic, crisp and just plain gorgeous. Mix that with Cassadee Pope's amazing voice, creates a wonderful duet. 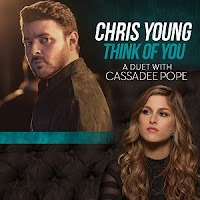 Chris Young and Cassadee Pope sing about no longer being the life of the party because when they think of me they think of you, which is portrayed perfectly in this music video. Chris Young has been a major success in the US, hitting the country charts hard, in addition to dipping into the Canadian country charts too. As well as mild success on both billboard charts. He has received no promotion here in the UK, and even though it seemed country music was about to hit it off big in the UK, it soon dissipated, with only a few stars making it over here. However. all it can take is one hit song to push a country star into international fame, and with a voice like Chris Young's I'll be surprised if he doesn't, at least, chart in the top 200 here in the UK, at some point in his career. As for Cassadee Pope, she too is an amazing country singer, however I truly believe she has what it takes to be a global success, she's fought for her career for an extremely long time, she deserves to be an international star, she just needs to keep fighting and to never give up the dream, she can do this. The song was written by Chris Young, Corey Crowder and Josh Hoge. It is about adjusting to being single after breaking up with your lover. Directed by David McClister, this is a perfect portrayal of the song. Both singers attend a party and yet they can't adjust to being single. It's clearly not possible, because when their friends think of them, they think of the relationship they used to be in. At times it's an exact transition from the song, such as the shots. Cassadee Pope, is having a real go at being the life of the party, and yet you can tell her heart isn't in it. She is much more happier after the party, in that café having some coffee late at night. Chris Young seems much more happier walking around the streets at night, than hanging at the bar totally unsure of what to do with himself. To be honest they look like they're at a club, which is definitely not the scene for Chris Young. As for the performance side of things, they both nail it. I can easily imagine the intense vibes this duet would create on stage. So much so that I'd really love to see these two perform live, their voices are magic as soloists, but together; now that would be special. Overall, I can't fault this video one bit, it could be considered pretty basic, and yet it's exactly what I want from this sort of music video. It relates, it has a perfect performance piece and the narrative is more than what I could imagine.